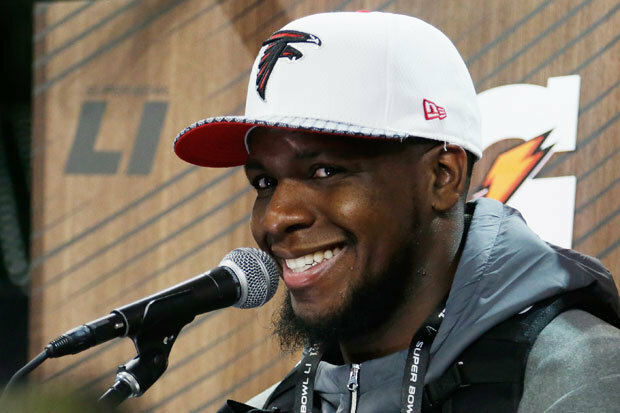 MOHAMED SANU is hoping he isn’t pants when his Atlanta Falcons take on the New England Patriots in Super Bowl LI. The Falcons are aiming to land their first title in Sunday’s showdown in Houston’s NRG Stadium.It promises to be the biggest game of Sanu’s career, but he has no intention of getting his knickers in a twist about it.Sanu insists he will prepare for it in the same way he gets geared up for all regular season matches. But there is nothing regular about the wide receiver’s bizarre preparations after he revealed he eats peanut butter sandwiches sitting in his lucky pants. Sanu said: “I think it’s going to be like any other game – but a little more special. The Falcons’ chances of success will rest on the shoulders of quarterback Matt Ryan, who will be playing in his first Super Bowl.But Sanu is not worried because he’s convinced Ryan is a class act both on and off the field.He added: “When I joined here I knew Matt was really, really good. Getting to talk to him and then being around him just solidified that he’s even better than you thought he was, because you really don’t get to see him. But I knew he was a great quarterback. “The way he’s prepared throughout the week, practicing with him and how he approaches each week and each game, it’s very surprising.